It’s Monday night, 70 degrees and I’m hitting the beer gardens with a friend. Is there a bad night to go beer gardening in the spring? 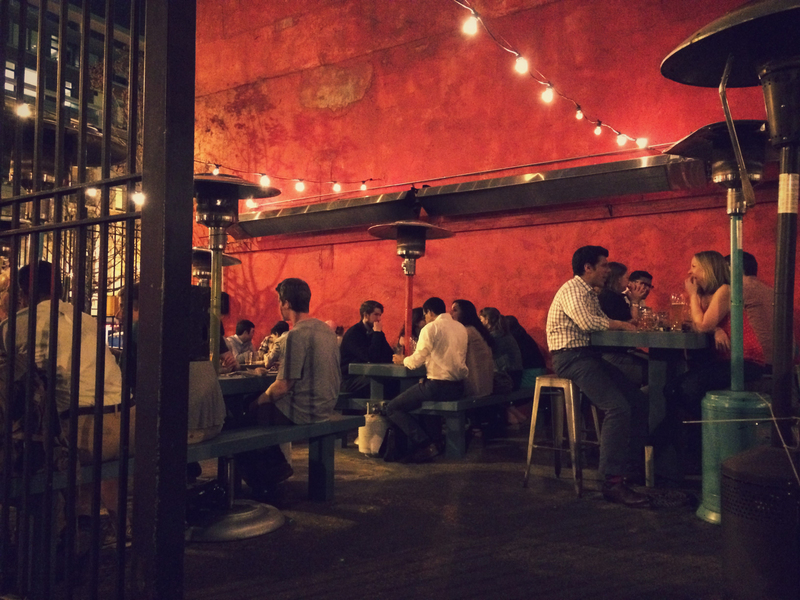 We went to Dacha Beer Garden in Shaw and Garden District in Logan Circle. I think I like both of them equally, but for different reasons. Dacha Beer Garden: This is your more classy/fancy beer garden. Nice pebble floor, sleek bar, huge painting on the outside wall. There’s even a little fire pit in the back. It’s also tucked away on a not-so-busy street, so it’s relatively quite and an all around peaceful place to hang out. The only drawback (if there has to be one) is there’s nothing to nosh on. My friend and I had a very delicious Straffe Hendrik Quadrupel ale (11%!). I’m no beer aficionado, so I won’t embarrass myself by describing the beer, but it reminded me of Chimay (blue label). Garden District: If Dacha is your fancy/classy beer garden, then Garden District is more like a dive bar. But a really cool one. It’s low key, looks like a pop-up beer garden, cozy and slightly crowded. I only say crowded cause no matter what day I go, it takes a minute to find a seat, if I’m able to find one at all! And they have food! Good food. I really wanted the bbq brisket sandwich, but by 9:30/10pm when we arrived, they were already sold out (not a bad sign for a Monday night), so I had the Cuban. It. Was. Good. Very similar to the cubans I remember having at Cafe Habana in NYC years ago (wonder if they’re still good). I had a Weihenstephaner Hefeweissbier (10.2%) to go with it, which light, fruity and refreshing. On the weekends they bring out the deep fryer and make fresh cinnamon cake donuts!